Our cattle feeding operation, where the Woodview Wagyu cattle are hosted, is ISO 22000 accredited, ensuring that our cattle are treated humanely and mitigating the risk associated with feeding and medicating of animals. At the core of this accreditation is our world-class Electronic Identification System (EID), which records every detail during the life cycle of every animal, facilitating the traceability of the meat from farm to consumer. Our Sparta Beef plant, where all Woodview Wagyu cattle are slaughtered and processed, is FSSC 22000 accredited and subjected to stringent health and safety measures. 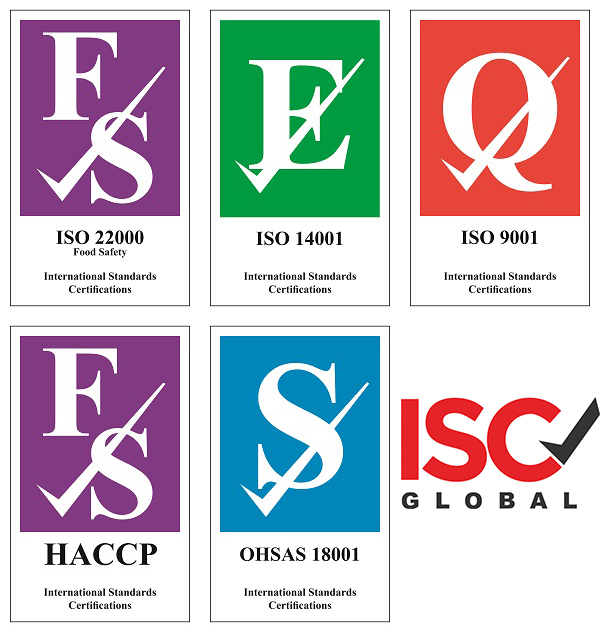 Fully recognised by the Global Food Safety Initiative, the FSSC 22000 accreditation demonstrates Sparta’s and Woodview’s commitment to ensuring world-class health and safety standards. Traceability through our EID system continues throughout our vertically integrated operation up to the deboned packaged product. The Sparta beef plant is certified Halaal by SANHA and NIHT. Radio Frequency Identification (RFID), also known as Electronic Identification (EID), enables us to quickly, easily and accurately capture an animal’s information (i.e. place of origin, sire, weight, breed, gender, intake date and weight, medication history, etc.) and review or record information into a record-keeping programme and database. This is an excellent management tool for individual animal record-keeping, traceability and quality assurance. This system kicks in at calf intake and continues throughout our vertically integrated operation up to packaged product stage.